From the time it was established in 1974, the National Institute on Drug Abuse (NIDA) has supported research on drug abuse treatment for people involved with the criminal justice system. Findings show unequivocally that providing comprehensive drug abuse treatment to criminal offenders works, reducing both drug abuse and criminal recidivism. The substantial prison population in the United States is attributable in large part to drug-related offenses and is accompanied by high rates of recidivism. As such, it is a matter of public health and safety to make drug abuse treatment a key component of the criminal justice system. Indeed, addressing the treatment needs of substance abusing offenders is critical to reducing overall crime and other drug-related societal burdens, such as lost job productivity and family disintegration. Scientific research shows that drug abuse treatment can work even when an individual enters it under legal mandate. However, only a small percentage of those who need treatment actually receive it, and often the treatment provided is inadequate. To be effective, treatment must begin in prison and be sustained after release through participation in community treatment programs. By engaging in a continuing therapeutic process, individuals can learn how to avoid relapse and withdraw from a life of crime. As reflected in our collaborative Criminal Justice–Drug Abuse Treatment Studies (CJ–DATS) Initiative, NIDA is committed to working across organizational boundaries to improve substance abuse treatment services. Multiple studies from different scientific disciplines have helped us understand the basic neurobiology of addiction, along with what constitutes effective treatment. Now we are at the point where the implementation of evidence-based treatment principles is called for within the criminal justice system to improve public health and public safety by reducing both drug use and crime. a resource section that provides Web sites for additional information. 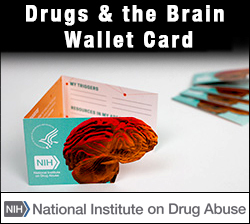 This booklet and other resources on drug abuse and the criminal justice system are available on NIDA’s Web site at www.drugabuse.gov/drugpages/cj.html. With the release of this landmark publication’s revised edition, we are optimistic that correctional agencies have begun to understand how drug treatment programs are helping achieve public health and safety goals for the Nation.